Join iradiophilly this weekend as we rebroadcast last Saturday's Haverford Music Festival. We were proud to broadcast LIVE all the performances from the Field Stage with over a dozen musical acts playing rock, pop, jazz, indie folk, and more. If you were one of the roughly 15,000 or more who attended, then tune into the Haverford Music Festival Replay station and relive the great performances or join in for the first time and hear something new. If you miss something, don't worry, we'll be playing the entire 8 1/3 hour set on a continuous loop all weekend long from Friday afternoon to Sunday evening. 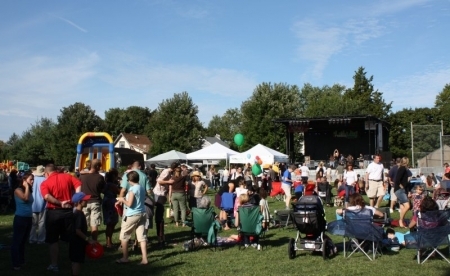 Enjoy the Haverford Music Festival Flashback Weekend September 13-15th. Three police officers were injured near the scene of the massive fire at Seaside Park this morning. A number of officers were traveling back to the police station in a military-style transport when a bench in the back broke off. Several officers tumbled out onto the roadway. Three officers, two men and one woman, suffered head injuries. Two were airlifted to Jersey Shore Medical Center and one was driven by ambulance. They have been identified as 39-year-old Brian Jackawski, a 15-year veteran of the force, 26-year-old Chelsea Richard, a season officer and 19-year-old Daniel Reale. Officials say Jackawski fell and hit a metal sign, Richard struck her head on a curb and Reale fell onto the pavement. Officer Jackawski was treated and released, Officer Reale is in stable condition and Officer Richard is in critical condition. On the one year anniversary of his death, Montgomery County officials honored fallen Officer Bradley Fox by dedicating a plaque at the site where he lost his life in the line of duty. The memorial site is along the Schuylkill River Trail in Plymouth Meeting. Fox was shot to death by a convicted felon after chasing him on foot following a car chase. Montgomery County District Attorney Risa Vetri Ferman and Plymouth Meeting Police Chief Joseph Lawrence hosted the Fallen Hero Plaque dedication. He was also posthumously awarded the District Attorney's Medal of Honor, the highest honor to be bestowed upon a law enforcement officer in Montgomery County. Fox's family was on hand including his wife Lynsay, daughter Kadence and son Brad Jr who was born months after his father was killed.